Why does this blank Word document look so daunting? I mean, you know your audience better than anyone. And you know how to market to them. So, why does making a list of topics seem impossible? Chances are, you just need a good brainstorming session to get yourself back in the groove. Let’s talk about 4 methods you can use for better blog post topic brainstorming. By the time you’re done reading this post, you should be well-equipped to create a long list of topics your target audience will love! As a marketer, this is one of my favorite ways to come up with new blog post ideas. It’s a pretty straightforward process – you find out where your target audience hangs out, look at the questions they’re asking, and write blog posts that answer those questions. By doing so, you can give your target readers exactly what they want. 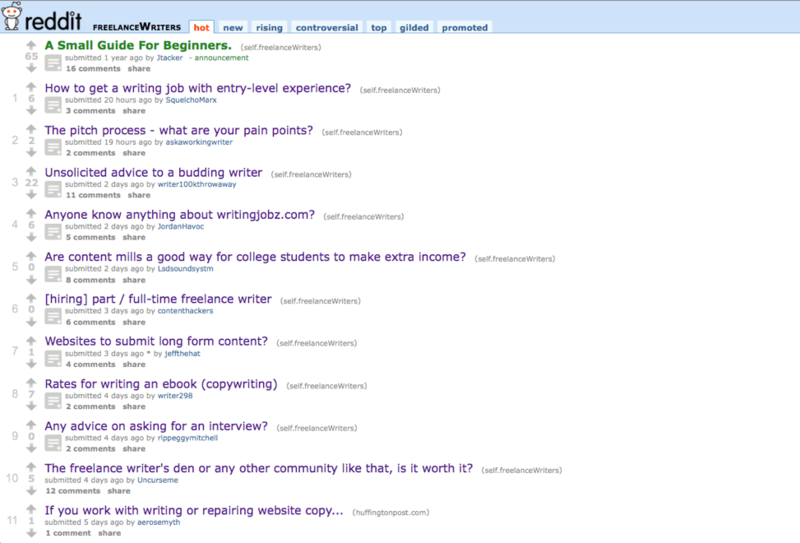 For example, since I run a blog that helps freelance writers, I hang out in the freelance writing subreddit pretty often. You can see that one writer here wants advice on asking for an interview. So, I could definitely consider creating an in-depth blog post on how to ask for an interview as a freelance writer. Another place you can find out which questions your audience is asking? Quora – a popular question-and-answer site. Then, you’d click it and scroll through the questions to determine which ones could be turned into blog posts for your business. 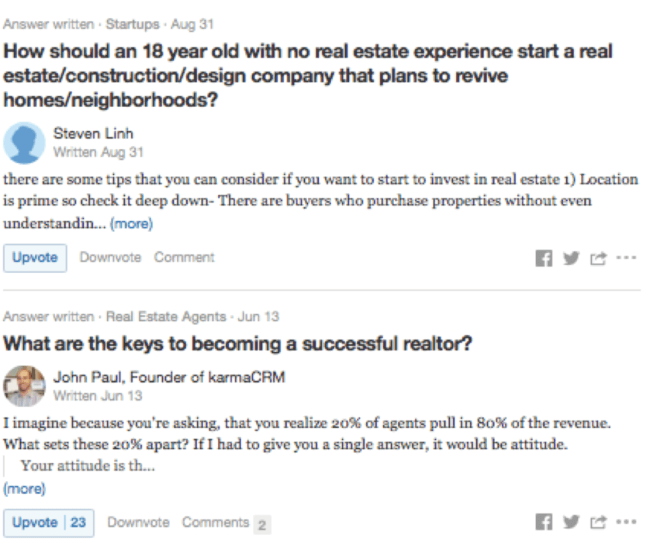 After looking at the first question asked in the screenshot above, you might consider writing a blog post about how someone with no previous real estate experience can start a real estate company. And you could write a blog post titled “The Ultimate Guide to Becoming a Successful Realtor” to answer the second question. No matter what industry you’re in, you should be able to use this strategy – there’s a popular online hangout spot for pretty much every niche! So, go ahead – find your audience, and make a list of the questions they’re asking. Then, figure out how to answer those questions in the form of helpful, actionable blog posts. Obviously, you don’t want to write the exact same blog posts as your competitors. But you can – and should – analyze what they’re doing to see what’s working. Let’s say you write about online marketing topics on your blog. First, you’d want to make a list of online marketing blogs with an audience similar to yours. Then, you’d look through those sites to see which posts are the most popular. For example, you might head over to the popular online marketing blog Quicksprout. 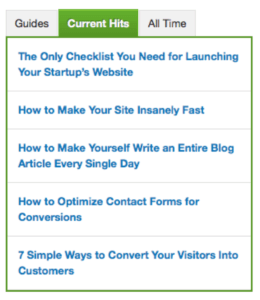 All of these topics would be close enough to the ones in the Quicksprout “Current Hits” list that they’d resonate with your audience of online marketers. But at the same time, the topics would be flexible enough to where you could put your own spin on them and avoid re-creating the exact same posts. That means they’d be a perfect fit to use for brainstorming topics for your blog. You can start using this strategy right away. Start by making a list of your successful competitors, and then check their site for a “popular posts” section to help you come up with the best blog post ideas for your audience. If you want to know which blog post topics your audience will love, it makes perfect sense to ask them, right? What’s the #1 challenge you’re facing? I say “a form of this question” because you need to tailor it to your specific audience and industry. What’s the #1 challenge you’re facing when it comes to marketing your healthcare clinic? Maybe they’re struggling to create effective ads. Maybe they don’t know how to convert their site visitors to patients. Or maybe they’re struggling to collect positive online reviews to serve as social proof for their clinic. Don’t have an email list yet? Consider asking this same question on the social media sites where you have the largest and most engaged following. Then, use people’s answers to help guide your blog post ideas. If you’ve been blogging for a while, you can use Google Analytics to see which of your posts are the most popular. 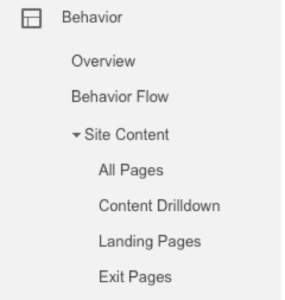 Open your website data in Google Analytics, and click “Behavior” in the left sidebar. Then, click “Site Content.” When you do that, you should see a “Content Drilldown” option. That’s where you can see a breakdown of your most popular blog posts. Brainstorm new blog post ideas based on those past successful topics. For example, let’s say you write about travel-related topics on your blog. If you notice that your 5 most popular posts all relate to budgeting for travel, you might want to consider writing more blog posts related to budgeting for travel. When you first start brainstorming blog post ideas, don’t stress too much over how good your ideas are – just let the ideas flow freely! Jot down as many blog post topic ideas as you can think of after using the strategies in this post. Sure, some of the topics you come up with probably won’t be usable – but the point is to have a long list of topic ideas. That way, you have plenty of options to choose from. Then, when it’s time to choose one topic to work on, you can be more of a perfectionist and make your decision based on research. Whatever you do, always keep your target audience’s needs in mind. If you can give them what they want in blog post form, they’re sure to keep coming back for more. How do you come up with new blog post ideas? Share in the comments section below!